HMG-CoA reductase inhibitors (statins) are commonly used in medicine to control blood lipid disorder. Large clinical trials have demonstrated that statins greatly reduces cardiovascular-related morbidity and mortality in patients with and without coronary artery disease. Also, the use of HMG-CoA reductase inhibitors has been reported to have immunosuppressive effects. We describe an unusual case of regression of vitiligo in a patient treated with high dose simvastatin. The relation between simvastatin and regression of vitiligo in this case report may be related to the autoimmune pathophysiology of the disease. This unexpected beneficial impact provides another scientific credence to the hypothesis that immune mechanisms play a role in the development of vitiligo and that the use of statins as immuno-modulator could be of use not only for treatment relative to organ transplant but in other pathologies such as vitiligo. A 55 year-old man was recruited in a clinical trial where medications have to be weaned. He had suffered from previous myocardial infarcts in 1988, 1992 and 1999. The subject is an ex smoker and is intolerant to aspirin and non-steroidal anti-inflammatory medication since the age of 28 years. He has also been diagnosed with vitiligo since he was 31 year old. Skin depigmentation has been mostly present on the face, chest and hands areas. Numerous treatment have been tried to alleviate the vitiligo without success. Strangely, the patient mentioned that signs of vitiligo was somewhat alleviated after he was given an HMG-CoA reductase (simvastatin) to control high blood cholesterol levels. The subject had been treated with metoprolol (Lopressor®; Novartis Pharmaceutical, New York, USA) 50 mg per os BID and clopidogrel (Plavix®; Bristol-Myers Squibb, New-York, USA) 75 mg per os OD since October 1999 as well as simvastatin (Zocor®; Merck Frosst, New Jersey, USA) 80 mg at bedtime since September 2000. Except for mild skin signs of vitiligo, mainly in the face and hands, physical examination upon entry in the study was normal with blood pressure at 120/80 mmHg and elevated low-density lipoprotein (LDL) cholesterol of 4.37 mmol/L, high-density lipoprotein (HDL) of 1.2 mmol/L and triglycerides (TG) concentrations at 1.9 mmol/L. According to the study protocol requirement, simvastatin was stopped on March 28th, 2001 until May 18th, 2001 when atorvastatin (Lipitor®; Pfizer; New York, USA) 10 mg per os OD was introduced. Five days later, on May 23rd, 2001, following the subject's request and the study physician recommendation, the subject was pulled out of the study due to the study medication's side effects (headaches). At the physical exam of May 23rd, 2001, it was noticed by the physician and reported by the subject that skin depigmentation secondary to vitiligo had increased significantly since the entry in the study two months earlier especially in the face area. Following the study discharge, atorvastatin was stopped and simvastatin re-started at a dosage of 80 mg at bedtime. Later, consent form was obtained from the subject and pictures taken on July 18th, 2001 (Figure 1). At this point in time, the subject had recently started his medication and clear signs of skin depigmentation, comparable to those found at the physical exam 55 days ago, were still present. 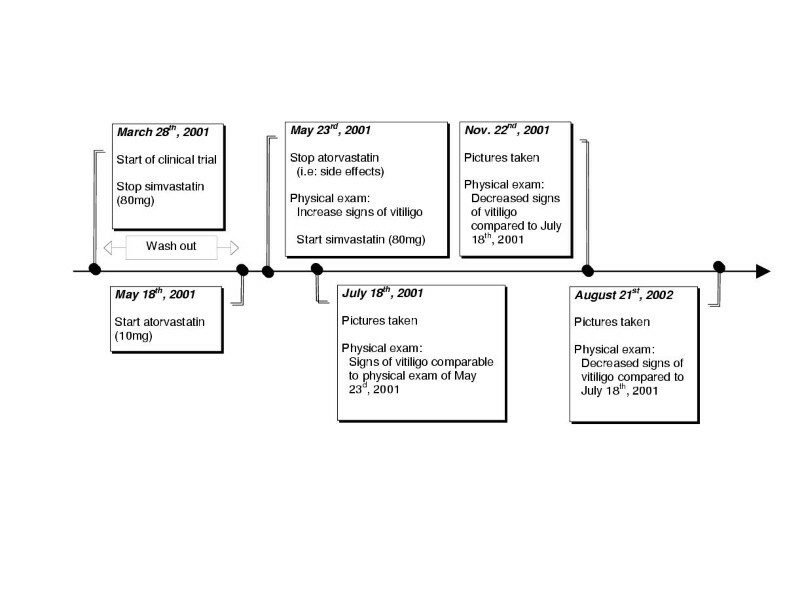 The subject returned for pictures on November 22nd, 2001 and August 21st, 2002 to compare the progression of his vitiligo in the summer and in the winter season (Figure 1). 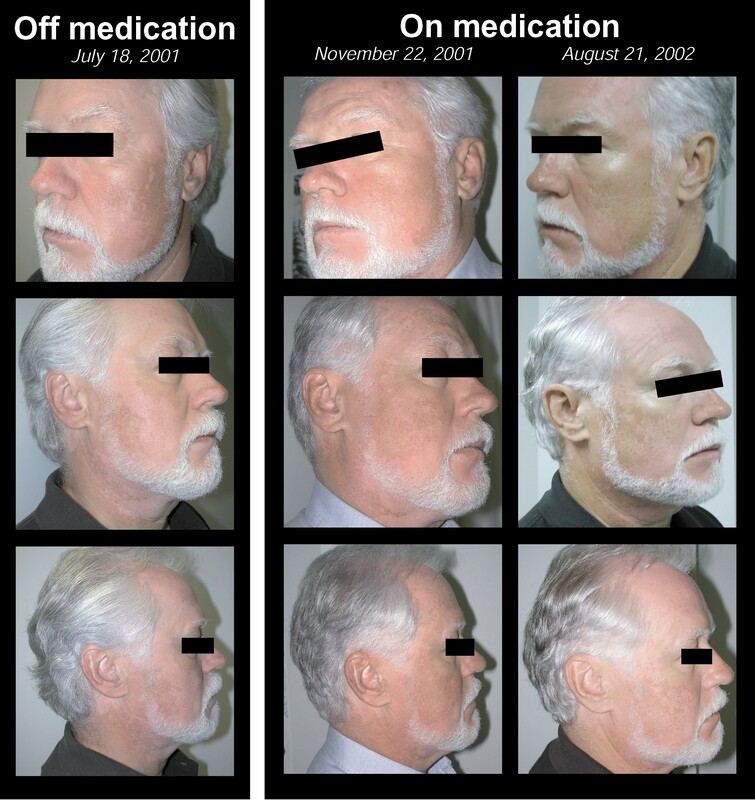 As compared in Figure 2, a clear regression of the skin's depigmentation of the face was noticeable between the sets of pictures when the subject was on and off simvastatin. Of notes, all other drugs were kept unchanged. Subject's picture showing a positive and unattended side effect of simvastatin on skin depigmenting disorder called vitiligo. Vitiligo is an acquired skin depigmenting disorder characterized by the loss of melanocytes, exocrine cells, from basal layer of the epidermal and the matrix portion of the hair bulb. It results in well-defined white patches, often symmetrically distributed. Vitiligo occurs worldwide in about 1% of the population, mostly man between the age of 10–30 years regardless of race, but more troublesome in dark skin individuals. So far, the cause of vitiligo has remained unknown but might involve genetic factors, autoimmunity (lopecia areata, thyroid disorders, Addison's adrenal disease, atrophic gastritis, pernicious anaemia, and diabetes), toxic metabolites and/or a higher vulnerability of melanocytes . HMG-CoA reductase inhibitors (statins) are commonly used in medicine to control blood lipid disorder. Large clinical trials have demonstrated that statins greatly reduces cardiovascular-related morbidity and mortality in patients with and without coronary artery disease [2–4]. After its ingestion, the inactive lactone is hydrolysed in β-hydroxyl acid and inhibits the hydroxy-3 methyl-3 glutaryl coenzyme A (HMG-CoA) reductase . The role of the regulatory enzyme HMG-CoA essentially limits the mevalonate pathway through which cells synthesize cholesterol. Although the pharmacokinetics and the metabolic pathway of simvastatin are complex, it basically reduces the synthesis of LDL cholesterol by the liver and other cells and increases its catabolism . The relation between simvastatin and regression of vitiligo in this case report may be related to the autoimmune pathophysiology of the disease. This hypothesis is supported by the frequent association of vitiligo with autoimmune diseases  and studies demonstrated that most vitiligo patients have antibodies against melanocytes . Although the application of the following animal model to the human disorder remains to be better establish, the Smyth line chicken model who depicts spontaneous postnatal expression of vitiligo showed an increase in T cells in the feather pulp and circulating inflammatory leukocytes . In human, circulating antibodies and T lymphocytes which react against melanocyte antigens are present in the sera of patient with vitiligo  and higher proportion of activated peripheral T cells, as determined by the expression of HLA-DR, has also been found in patients with vitiligo compared to healthy individual . In a study of 49 biopsies from the margin of depigmented cutaneous lesions, the expression of Major Histocompatibility Complex class II (MHC-II) antigens demonstrates activation of the infiltrating T cells . Lesional T cells rather than circulatory anti-melanocytic antibody may also be responsible for the autoimmune patchy destruction on cutaneous melanocytes in vitiligo . When compared to healthy individuals, a significant proportion of patients with vitiligo had circulating antibodies and T lymphocytes, which react against melanocytes antigen present in the sera . Indeed, it has been reported that normal melanocytes are capable of presenting antigenic peptide fragment to well-defined proliferative cytotoxic T cells in a MHC class II-restricted manner . Therefore, since these molecules have important roles in normal antigen presentation and the activation of helper T lymphocytes, their expression by the melanocytes may contribute to the abnormal cellular immune response seen in vitiligo. Kawakami et al. further confirmed that T cells specific response for melanoma cells and melanocytes appear to be involved in the rejection of melanoma tumour as well as in the development of autoimmune reaction of patient with vitiligo. Since a number of reasonably effective therapies for vitiligo (psoralen with ultraviolet A radiation, topical corticosteroids and topical cytotoxic drugs) are immunosuppressive in their mode of action, animal models of the disease and the association of vitiligo with MHC antigens, we reasonably speculate that immune mechanisms may play a major role in the development of vitiligo. Interestingly, the use of lipid lowering agent, specifically HMG-CoA reductase inhibitors, has been reported to have immunosuppressive effects in a study of heart transplant recipients . The drug-induced reduction of LDL cholesterol may lead to more free cyclosporin in the blood where its immunosuppressive effect is due to blockade of interleukin-2 synthesis in activated T lymphocytes . Kwak et al. showed that statins act as direct inhibitors of the induction of MHC-II expression by interferon-gamma (IFN-γ) and thus as repressor of MHC-II mediated T-lymphocytes activation in human endothelial cells. Using RNAse protection assay and flow cytometry, it was observed that simvastatin, in a dose dependent fashion, reduced IFN-γ induced MHC-II expression (mRNA and protein) through actions on the CIITA promoter I . It is important to note that the subject of this case report was on a high dose of simvastatin (80 mg OD). Regulation of the expression of MHC-II genes is highly complex, and this tight control directly affects the T-lymphocyte activation and thus the modulation of the immune response. Consequently, by repressing the induction of MHC-II, and subsequent T lymphocytes activation, the action of HMG-CoA reductase inhibitor, mostly used as lowering blood cholesterol agent, may provide new type of immuno modulation as suggested by our case report and literature on organ transplant recipients. We describe an unusual case of regression of vitiligo in a patient treated with high dose simvastatin. This unexpected beneficial impact provides another scientific credence to the hypothesis that immune mechanisms play a role in the development of vitiligo and that the use of statins as immuno-modulator could be of use not only for treatment relative to organ transplant but in other pathologies such as vitiligo. However, even though reduced chronic rejection and decreased graft arteriosclerosis was seen in rats recipients of heterotopic heart transplant [18, 19] and a reduction of acute rejection reactions was documented in pravastatin-treated human subjects compared with controls receiving only prednisone, azathioprine and cyclosporine , caution should be use when associating statins in purely immune-related pathologies. Other clinical trials have failed to demonstrate clinical benefits of statins as immuno-modulators in transplant patients . Therefore, a prospective study should be initiated to try to answer the hypothesis associating the use of statins as an immuno-modulator for the treatment of vitiligo. The authors want to express their gratitude to Dr Jean Davignon for his scientific input. Written consent was obtained from the patient for publication of the study. PP envisioned the paper and MN, PP prepared the initial draft of the manuscript. CG, JB and JJ critically revised the manuscript for important intellectual content. All authors read and approved the final version of the manuscript.